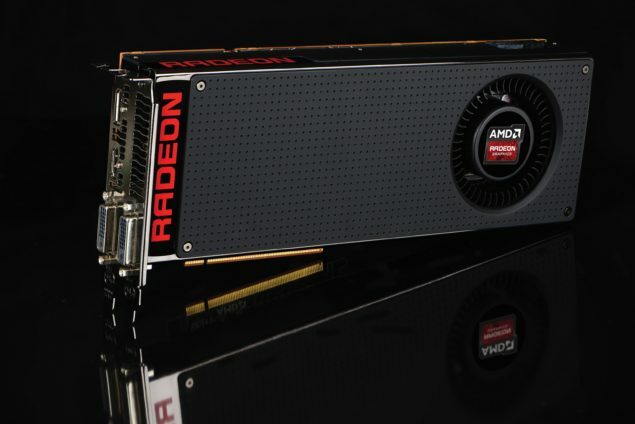 AMD is expected to launch yet another graphics card last this year in the form of the Radeon R9 380X. After gaining some market share in the discrete graphics market in Q3 2015, AMD aims to release more competitive parts in the market. The latest Radeon R9 380X which is expected to launch later this year will be aiming at a sweet price point in the sub-$300 US price range. The first thing to note about the Radeon R9 380X graphics card is that it is based on the Antigua XT chip that is manufactured on a 28nm process as reported by HWbattle. 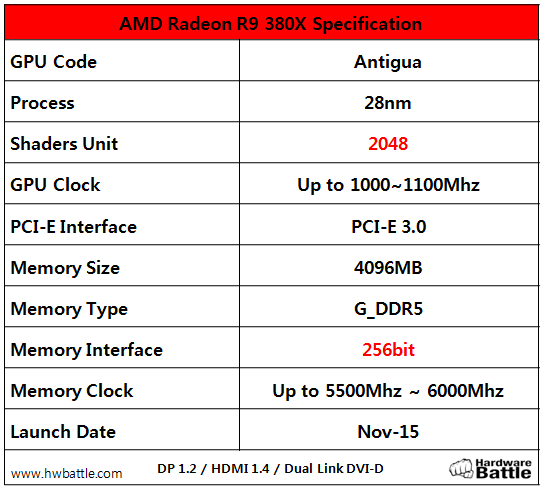 Antigua is a new name for Tonga which has been featured on the Radeon R9 285, the Radeon R9 380 (Antigua Pro) and now the Radeon R9 380X (Antigua XT). As the name suggests, the XT chip will be the fully enabled SKU with higher core configuration than the Radeon R9 380 which launched many months back at a price of $199 US. The Radeon R9 380X with the Antigua Pro GPU packs 2048 stream processors, 128 texture mapping units and 32 raster operation units. The graphics core clock ranges between 1000 to 1100 MHz while overclocked models will feature increased frequencies. The card comes with 4 GB GDDR5 memory while the Radeon R9 380 came in both 2 GB and 4 GB options. The memory is featured across a 256-bit bus interface that is clocked around 5500 to 6000 MHz. Display outputs include Dual-Link DVI, HDMI 1.4 and a Display Port 1.2 output. The card is based on the latest GCN 1.2 iteration which is the same as the Fiji graphics core. It is fully compliant with features like Color Compression, Vulkan API support and DirectX 12 API support. The card packs 8 ACE units (Asynchronous Compute Engines) which allows tasks to be submitted and processed by shader units inside GPUs simultaneous and asynchronously in a multi-threaded fashion. Furthermore, the card comes with the latest XDMA CrossFire technology that allows multi-GPU functionality between one or more cards of the same kind effectively. AMD’s Radeon R9 380X will be the full Tonga chip finally coming to the desktop market since the Tonga XT chip is currently only found on the Apple iMac and desktop users only received the Tonga Pro chip in return. Antigua XT will have a TDP around the 200 – 225W range since the Antigua Pro based Radeon R9 380 currently has TDP of 190W. The similar chip make will allow several AIBs to offer custom designs at launch since the same custom PCBs used for the Radeon R9 380 can be configured for the Antigua XT chip and we have already seen a custom design in action from XFX. The Radeon R9 380 will definitely be a good option for users if it launches near at a price of $249 US since NVIDIA doesn’t have a competitor in that range and they might be forced to launch one if AMD manages to grab a decent share from the market. We will be looking at the Antigua XT chip around Q4 (November 2015).